As I was doing my morning walk in the treadmill yesterday, I was thinking of what to cook for dinner. I remember the left over crab meat from our dinner the previous night. I still don't have solid idea what to cook it with though because it was only a little. Then a crazy idea popped into my head "What if I incorporate the crab meat into a ground beef and stuff the red bell peppers that we bought recently?" I wasn't sure if it would turn out okay because it was an odd combination but it's always fun to experiment in the kitchen. Cut the peppers in half and remove the seeds. I normally remove the stem of the peppers but this time, I left it on there. The green color just adds color and it makes it more beautiful. Mixed all the ingredients well and stuff each pepper halves. Lay it on a baking dish, I always use my pie pan for everything (lol). When it is done, put the cheese on top of each stuffed peppers and return it in the oven just enough to melt the cheese. It would be easier to just use the ready-mixed Italian sausage but since I did not have it in my fridge and I wanted to do a little experiment, I went with my instinct to just go and have fun with it. I was skeptical to add the crab because my husband doesn't like crabs. It was a bold decision but guess what, it paid off because he loved it! He said that there's something different about the dish but he loved it! Shhhh, I didn't tell him I added crabs in it, lol! He even ate the left over with spaghetti noodles! I made a hearty breakfast for them to boost their immune system and somehow kick the sickness away. Right now, my daughter is fevered so we gave her some meds. Baked potato hash, scrambled eggs, and cantaloupe is what we had this morning. The scrambled egg has some cheese, parsley salt and pepper. I baked my hash this time. Ingredients are chopped sausages, green bell pepper, onion, salt, pepper, and steak seasoning. You can add some cheese at the last minutes of the baking. I baked it for 50 minutes and it was delicious. Even my daughter is sick, she ate the whole thing that I put in her plate. Here's the men chugging their lemon water. I hope that my princess will feel better soon. When it comes to technical issue about a website, I am not the person to ask because I am not techie and my know how is very limited. A colleague asked some help about her website issue but I couldn't help her because I really don't know what to do. I keep my domains from Blogger platform/Google because it is easier, I don't want to deal with the technical aspect of it. With Google, all I have to do is pay for the due during the year and that's it, I don't have to worry about transferring or getting codes and stuff like that. Yesterday was another busy weekend at home, cleaning, doing laundry, cooking, and doing some repairs. I bought a pack of smoked salmon at Wholey's a couple of weeks ago and prepared it for breakfast yesterday. I baked it for twenty minutes but it was still half frozen when I took it out so I decided to pan fry it in big chunks. We ate it with steamed rice, and cucumber, scallion, and tomato salsa with soy sauce. Hubby, the kids, and I all loved it. Of all the smoked fish that we had, the salmon is by far our favorite. It's a little pricey but it's worth every penny. We plan to buy some again when we go to strip District in Pittsburgh. Do you know how to "do" salsa? I can make salsa but can't do the salsa dance hehehe. My poor feet are both left so I have no rhythm at all. But anyway, I wish I could have some of the professional's salsa lessons santa monica. It would be so nice to learn how to dance especially ballroom dancing. How about you, do you think you can dance and do some salsa? Add flour to resealable plastic food bag (I used mixing bowl). Add chicken chunks and seal. Shake bag to coat chicken evenly (I did this step using my hands to coat the chicken). Combine seasoning, sugar (honey), soy sauce, water. Blend and set aside. Heat oil in a large skillet over medium high heat until hot. Add flour coated chicken and cook until evenly brown. Stir sauce mixture and add to skillet with chicken. The Verdict: My husband loved it, he said it's like eating at a Chinese restaurant. The only problem he said is that "It made him ate two plates and it ruined his diet portioning" lol. Over all, I am satisfied with the authentic Asian taste that I found in cooking this meal through the help of the seasoning mix that I bought. So I was curled up in our couch in agony due to cramps and thinking what to cook for dinner. Suddenly a sound "ding" came into my brain and had this idea to make a salmon cake. I bought salmon the other day from the store thinking of grilling it but since I have a dysmenorrhea, I thought of making my job a little easier. Ingredients: You can ad whatever ingredients you want, this is just what I use with mine. Boil one cup of water, put the lemon, and and salt. Add the salmon when the water is boiling. Or you can just cook the salmon in water and salt. I just ad lemon grass because I love the earthiness aroma of it and it somehow eliminates the fishy smell of the salmon. While the salmon is cooking, mix all the ingredients up in a bowl. When the salmon is cooked, remove the skin and shred it into desired chunks/pieces. Add it to the mixture. You can fry them or bake them. I pan-fried some for the kids and baked the rest in 350 degrees heat for 40 minutes. Make sure to spray the foil or baking sheet with oil spray so the salmon cake won't stick. I would say, I love the baked ones more, it got crispier and it does not have oil in it, a lot healthier. Hubby and I ate ours with my kohlrabi achara, rice, and some blanched beans while the kids ate theirs with vegetable and fruit salsa (cucumbers, tomatoes, and strawberries with soy sauce). We had a pretty good diner tonight. Another success menu in my kitchen. There are different kinds of recipe for confetti salmon cake but this is my take based on the ingredients I have gathered in my fridge. This kind of pepper is very common in the Philippines. It is called Siling Labuyo in there. This is believed to be the most spicy among the peppers. MY husband said that this grows wild in Guam and they cal it Boonie peppers. A friend of mine gave this plant to me last year and I thought that it was going to die during the winter because of lack of sunshine but it survived. I put it by our window where the sunlight can come in. It has so many blooms and they are starting to ripe. I remember what my father would always do when we have a lot of this. He would put them in a vinegar with salt and it last for a very long time. This is my father's favorite pepper. For every bite of food he ate, there is one of this peppers in it. I did the same technique that Papa had before. Let us see if this would last. I love spicy food and hubby does too but now, hubby is kind of allergic to spicy food. He gets blister inside o his mouth when he eats very spicy which bums him out because he loves spicy food. As I have mentioned in my daughter's blog, my son also got a personalized lunchbox from I See Me. I am extra grateful when a company sends me two of their products especially if their children's products because I have two kids that are very competitive to each other. Once the other has something, the other wants one too and I guess that is normal for siblings. Again, thanks to I See Me for sending each of my kids their back to school personalized lunchboxes. I will be registering them tomorrow and as we ate breakfast today, they were already telling me what they would like to have for their cold lunches on the first week as the school don't serve paid lunches on the first week of school. I love that the lunch box is very spacious. I already washed their lunchboxes so it is clean and ready for next week. These lunchboxes are made in China so I cleaned them thoroughly. As many negative notes being written on the news about products made in China, it always wise to be cautious. I wish that many companies here in the US would make their own products so they don't have to import it from China. I do understand that it is costly but I think that products made here in the US is a lot better than the cheap ones that you see made from the leading country when it comes to production. The company where my husband works used to import their parts from China but they did an investigation why parts that are coming from there doesn't last very long. They found out that the said parts are being made in a very poorly working conditions so the quality of their production suffers. I am not saying that these products are not good, in fact they look very durable but you can't help but think sometimes. As long as you clean them really good, it would be fine. In fact I See Me, have a written instruction of washing it first before using it to make sure that it is safe. Anyhow, below is normally what I prepare for my kids lunches when they want to take their own lunches. See how perfect the bento containers fit in the lunchbox? Aside from lunchboxes, I See Me also has personalized puzzles , coloring books, placemats, stickers, and growth charts! You can find special gifts for special occasion that kids can't resist when you give it to them. So are you ready to check out what I See Me has in store for Back To School? 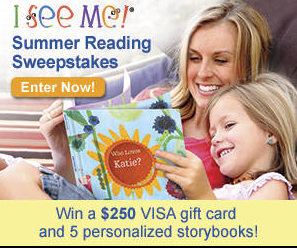 You can also join their Summer Reading Sweepstakes for a chance to win the grand prize of $250 Visa Gift Card and 5 Personalized Books!! 25 Runners Up will also get a personalized coloring book. This sweepstakes will end on 8/31. If you are like me who has kids that love personalized stuff like these, like and follow I See Me on their social network such as Facebook, Twitter, Pinterest, and Instagram. Thank you very much I See Me! !